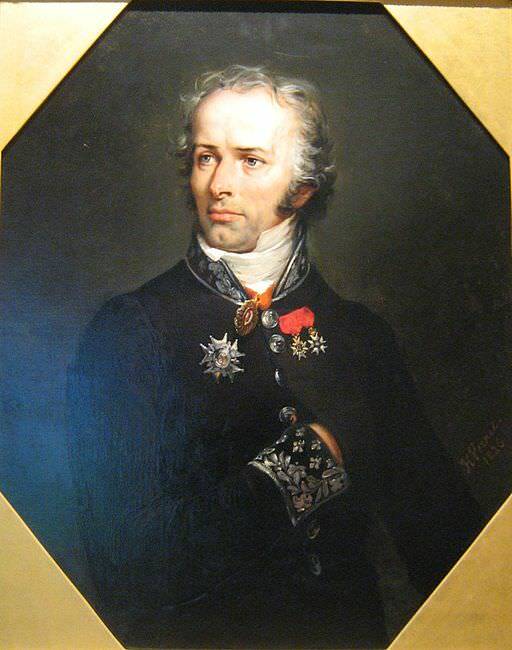 General Maximilien Sébastien Foy was a model of military and civic virtue. A courageous soldier during the French Revolutionary and Napoleonic Wars, he refused to kowtow to Napoleon. Following Napoleon’s defeat, General Foy became an eloquent defender of liberty in the Chamber of Deputies. Foy was modest, hardworking and a man of integrity. He was greatly respected in France, as shown by the tributes paid to him and his family upon his death. Maximilien Sébastien Foy was born on February 3, 1775 in Ham, France, the youngest of five children. His father Sébastien Florent Foy, a former soldier, died when Foy was four, so he was raised by his mother, Élisabeth Wisbeck. Noted at a young age for his intelligence and prodigious memory, Foy was educated at the College of Soissons and at the artillery school of La Fère. He was commissioned as an artillery officer at the age of 17, and served in Flanders. Suspected of sympathizing with the Girondins, in 1794 Foy was called before a revolutionary tribunal, stripped of his rank and sentenced to prison. Thanks to the death of Robespierre, he did not have to stay there long. Foy fought in the subsequent French campaigns in Germany, Switzerland and Italy. Later that year, Foy refused to vote in favour of Napoleon assuming the title of Emperor. He had no particular hostility towards Napoleon. However, like the Marquis de Lafayette, Foy was an advocate of liberty. He believed in the rule of law, rather than the rule of an emperor. Such slights did not go unnoticed. Foy went for nine years without promotion, though he continued to serve in the army with distinction and was many times wounded. In 1808, Foy finally became a general. He spent the next six years campaigning in Portugal and Spain. In the final battle at Orthez in February 1814, he was captured after being hit in the shoulder by the splinter from a shell. After Napoleon’s 1814 abdication, Foy served under Louis XVIII’s reign as an inspector-general of infantry. When Napoleon escaped from Elba and returned to France in early 1815, Foy declared his support for the Emperor only after Napoleon had reached Paris. General Foy commanded an infantry division at the Battles of Quatre Bras and Waterloo. He later made clear that had been fighting for France, not for Napoleon. After Napoleon’s 1815 abdication, General Foy retired from military service. He began to write his History of the War in the Peninsula, which was published after his death. In 1819 General Foy was elected to the Chamber of Deputies. Known for his eloquent defence of liberty, he became the acknowledged leader of the opposition. When the ultra-royalists, led by the Count of Artois, gained the upper hand, Foy became increasingly critical of the government. 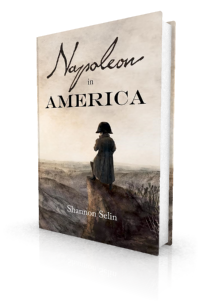 As in Napoleon in America, he was invited to join plots against the Bourbon regime. His critics accused him of provoking sedition, but royal prosecutors were unable to find sufficient evidence to implicate him in any conspiracy. General Foy died of an aneurism of the heart in Paris on November 28, 1825, at the age of 50. To read his last words, click here. He was given a public funeral. At least 20,000 citizens (one source says 100,000) followed his coffin from the church to Père Lachaise cemetery in a heavy rain. The procession lasted four hours. Foy was survived by his wife, Élisabeth Augustine Daniels (1790-1868), whom he had married in 1806, and their five young children: Blanche Hélène (born March 6, 1814); Maximilien Sébastien Auguste, called Fernand (June 21, 1815); Tiburce (Aug. 26, 1816); Isabelle Joséphine (Feb. 28, 1818); and Maximilien Sébastien Frédéric (March 12, 1822). As Foy died a poor man, a public appeal was undertaken to assist the family, raising a large sum in a few weeks. P.F. Tissot, Discours du Général Foy, Vol. I (Paris, 1826), p. xxiii. London Quarterly Review, Vol. 64, No. 128 (October 1839), p. 240. Edward Creasy, The Fifteen Decisive Battles of the World: From Marathon to Waterloo, 12th edition (London, 1862), p. 602. Discours du Général Foy, Vol. I, pp. 294-295. Thanks Shannon, I had not heard of this admirable figure. In defense of N I would make two points. First, though he unjustly failed to promote Foy, neither did he persecute a man known to oppose the political policy of N. Foy stood in political opposition to his commander-in-chief in a time of extreme politics. I don’t think a soldier in the US military who openly opposes the presidency (not just the current president) if very likely to become a four star general. Second, I think it is still debatable if democracy would have succeeded in France in 1800. Most historians believe that for democracy to work the circumstances have to be right. The history of democracy since N has recorded far more failures than successes. Admittedly, we all hope for the eventual success of democracy in some form but the jury is still not in, 200 years after the fall of Napoleon. Thanks for these excellent points, Addison. It is definitely to Napoleon’s credit that he did not take more severe action against Foy and did, ultimately, promote him. Blanche Foy married Theobald Piscatory and lived at the Château de Chérigny in Sarthe. One of their daughters married Maximilien Sébastien Frédéric Foy, her uncle: their son, Max Foy, met Daphne du Maurier when she visited in the 50s. (The surname du Maurier comes from a farm on the estate of Chérigny). Thanks, Elizabeth. It’s always great to learn what happened to the descendants of the people I blog about. I’m glad things turned out well for Blanche and her brother. According to accounts of the time, the family was left in very poor straits when General Foy died. We have been researching my husbands family tree and by coincidence learned about the amazing General (though we have never managed to make a connection) and even managed to visit his tomb in Pere Lachaise Cemetry in Paris. While we were there an elderly gentleman came along with a cart of mops, buckets and brushes to clean out the tomb. We managed to communicate that our name was Foy and he then, quite amazingly, invited my husband into the tomb and even unfurled the General’s standard for him to hold. It was an incredible situation! My mother in law researched the Foy family and she was convinced that they were of French (possibly Huguenot) descent so we are particularly interested to know more about the General’s sons. Can you provide any information about any of them? Thanks, Jean and Alan. How marvelous that you were able to go inside General Foy’s tomb! As for his descendants, this page (in French) provides a detailed list, with links to more information about some of them: https://fr.wikipedia.org/wiki/Famille_Foy. Maybe you’ll see a name of interest there. Thank you, Simone. It’s lovely to make your acquaintance, and to learn that some of General Foy’s descendants wound up in Canada. If other descendants contact me, I’d be happy to put them in touch with you. Many years ago my English cousin, Ray Foy, said that he had a letter from General Foy of France that had been in the family’s possession and that we were related to General Foy. The story is that two French brothers “jumped ship” on the west coast of England, near Minehead, and were living there in the mid-1700’s. I am trying to find the relationship. I was very interested in two things that are true of our family, heart issues and excellent memory. That’s interesting, Linda. Those two brothers must have had quite the life. It’s great that your family has one of General Foy’s letters. Sorry to be Capitaine Pedantique but as a divisional commander in Reille’s II Corps Foy was actually at Quatre Bras and not Ligny. Many thanks, Roger. I’ve amended the post accordingly. I will congratulate the First Consul as much as he likes on having escaped a conspiracy against his life, but I will never...make my officers sign an address which designates such or such individuals as authors or chiefs of this conspiracy because I am a soldier and I am not a judge.